A massive asteroid the size of a mountain soared past Earth on Monday, giving astronomers their first chance to learn about the giant rock. Amazingly, they discovered it has its own moon. 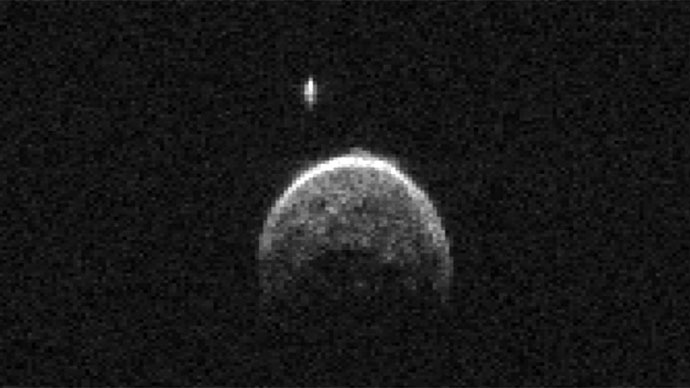 With asteroid 2004 BL86 traveling at 35,000 mph (56,300 km/h), scientists were able to detect at least one moon traveling with it. They discovered new measurements for the space rock, which totals 1,100 feet (325 meters) across and 1,800 meters in diameter. Scientists were also able to observe boulders and small features on the surface of the asteroid, and calculated that the accompanying moon has a diameter of between 164 and 328 feet (50 and 100 meters). "Previous studies of the light around 2004 BL86 already identified a moon orbiting the asteroid, and the new images confirm the discovery," NASA scientist Lance Benner told Space.com. Benner said about 17 percent of asteroids in 2004 BL86's size range have smaller objects trailing along with them. He compared the object to another asteroid that made a close flyby of Earth six years ago, called 2008 EV5. Both rocks have an equatorial ridge around the middle, which makes them look "kind of like a muffin, or perhaps a top," said Benner. While scientists say the space rock does not pose a threat to Earth for the foreseeable future, Asteroid 2004 BL86 is classified as a potentially hazardous asteroid (PHA) – one of 1,500 traveling in our solar system. That means they travel within five million miles (eight million kilometers) of Earth. Asteroid 2004 BL86 won't be back for another 200 years – but when it does return, it will be closer to Earth each time. Scientists said that on this flyby, they will learn about BL86’s rotation rate and get an idea of its composition. NASA added that with radar, scientists can see what the asteroid looks like on the surface, including its roughness. This will help improve calculations regarding its orbits and also give information on its velocity, which helps determine predictions for the future. "Now that we have the radar data [of 2004 BL86] from both last night and tonight, we'll be able to predict this much further into the future," Jet Propulsion Lab scientists Paul Chodas said to Space.com. "And over the centuries, and as far as a millennia, this asteroid will be approaching slightly closer each time. So it's definitely one we'll want to keep our eye on."